In contrast to most Japanese painting schools of the Edo period (1600-1868), Nanga artists looked for inspiration to Chinese scholar painting- the work of cultivated amateurs- that they knew through woodblock-printed books. The woodblock medium changed the intentionally bland brushwork of the Chinese style into a stronger two-dimensional design, creating simplified surface patterns and flat ink tones that appealed to Japanese taste. Buson used a Chinese theme for this work. But instead of imitating a specific prototype, he followed the Japanese idea of selecting a style appropriate to his subject. The asymmetrical composition recalls the type created by the professional painters of the Southern Sung (1127-1271) and Ming (1368-1644) periods, whose work formed the foundation of Japanese ink-painting styles. 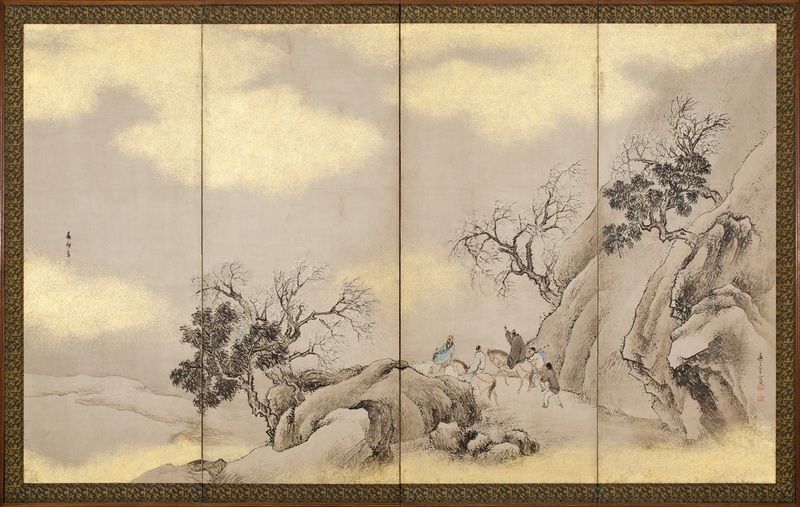 Travellers on Horseback may be one of a set of four screens depicting the seasons- a major theme in Japanese painting. Buson was also one of Japan's best haiku poets, and the lyrical style of this painting reveals qualities found in his poetry: momentary impressions characterized in simplified evocative images.